Surface One fabricated and installed Super White Quartzite, Blanco Maple Silestone, Volakas Marble, and Leathered Uba Tuba Granite in this home located in The Preserve in Hoover. This luxurious home is located in The Preserve in Hoover and was built by Byrom Building Company. 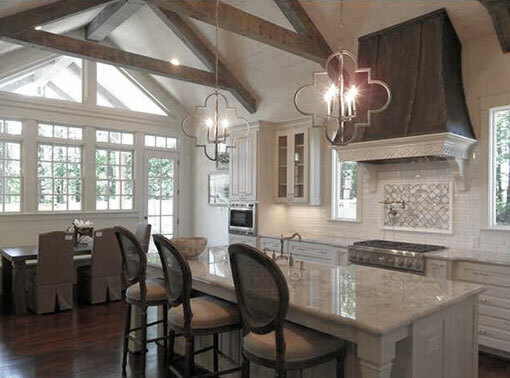 The spacious kitchen has vaulted ceilings with wooden beams that span the kitchen and eating area. Surface One custom fabricated and installed Super White Quartzite on the kitchen counters and the large kitchen island. Quartzite is a natural stone that is popular for kitchens because it is strong, durable and stain resistant. The color variations can give the elegant appearance of Marble with durability that is comparable to Granite. The natural gray and white pattern of the Super White Quartzite adds a sophisticated look that complements the custom white cabinetry and white subway tile backsplash. 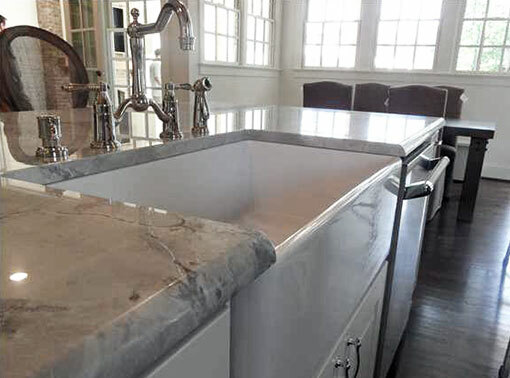 The island countertop was custom designed and fabricated to house a large white farmhouse sink. With dark wood flooring and lots of natural light from the breakfast nook windows, this kitchen has an open and comfortable feel. This home also features a butler’s pantry where Surface One installed Blanco Maple Silestone countertops. Surface One custom fabricated a curve in the edge of this countertop to meet the needs of the client. 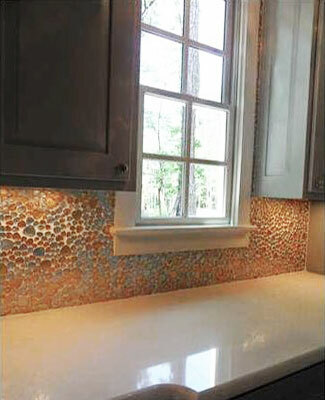 Silestone Quartz is a durable man-made surface manufactured by Cosentino with a wide variety of colors and textures. The master bathroom features Volakas Marble on the vanity countertops. Volakas Marble is a natural stone that comes from the mountains in the Drama area of North Greece. The light grey and white pattern adds elegance to any room. In the upstairs bathroom, a leathered Uba Tuba Granite was selected. Leathered granite is becoming a popular finish for granite that has a natural textured look and feel. Leathered granite is a smart choice for bathrooms because it can add unique style to smaller spaces, and it hides water spots better than many polished surfaces. Surface One is excited to have been a part of the birth of the new “Joe”. The newly renovated Sewell-Thomas Stadium is a state-of-the-art baseball facility that seats 5,500 with several new upscale club and dining options. 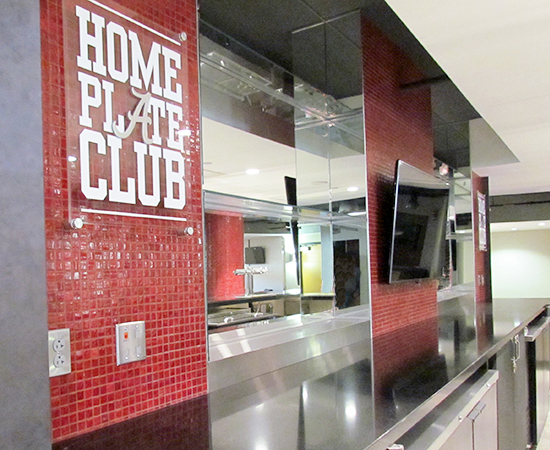 Surface One installed Zodiaq Quartz countertops and bar tops in the .525 Club and the Home Plate Club. The University of Alabama baseball stadium was originally constructed in 1948 as the Thomas Field. It was named in honor of Frank Thomas, a former Crimson Tide head football coach. In 1978 the University of Alabama baseball stadium was renamed Sewell-Thomas Stadium to recognize former Alabama baseball player and head baseball coach Joe Sewell. Joe Sewell had just been inducted into the Baseball Hall of Fame in 1977. Over time, the stadium has been through many renovations and is fondly referred to as the “Joe”. 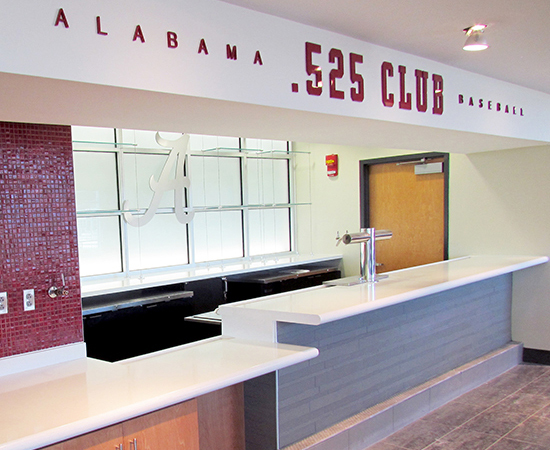 The .525 Club is a new upscale seating and hospitality area on the first base side of the field. Seating is covered. The hospitality area is climate controlled with a view of the field and includes flat screen televisions throughout the club. The .525 Club features a long Zodiaq Quartz countertop in the bar and beverage area. Surface One fabricated Zodiaq Quartz laminated edges to create a seamless transition between the bar top and the counter top. 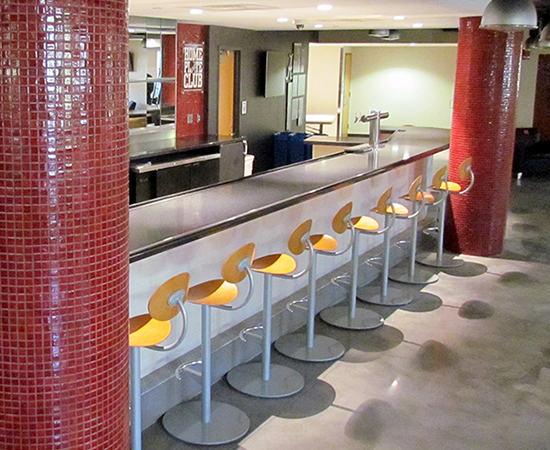 Surface One also fabricated and installed Zodiac Quartz drink rails along the walls facing the field. 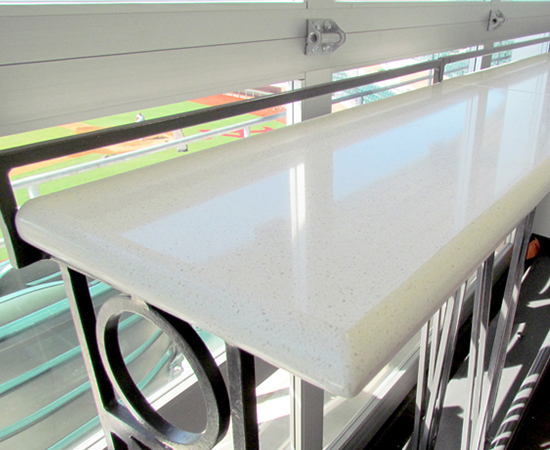 The quartz countertops in the .525 Club are all Zodiaq Cloud White and feature a smooth 2cm full bullnose edge. The Home Plate Club is a plush club area located behind home plate underneath the seating bowl. The sports bar atmosphere features bar and table seating with flat screen televisions through out the club. Surface One fabricated and installed Mystic Black Zodiaq Quartz countertops in the kitchen and bar area of the Home Plate Club. The focal point of the Home Plate Club is a long seated bar with Mystic Black Zodiaq Quartz. 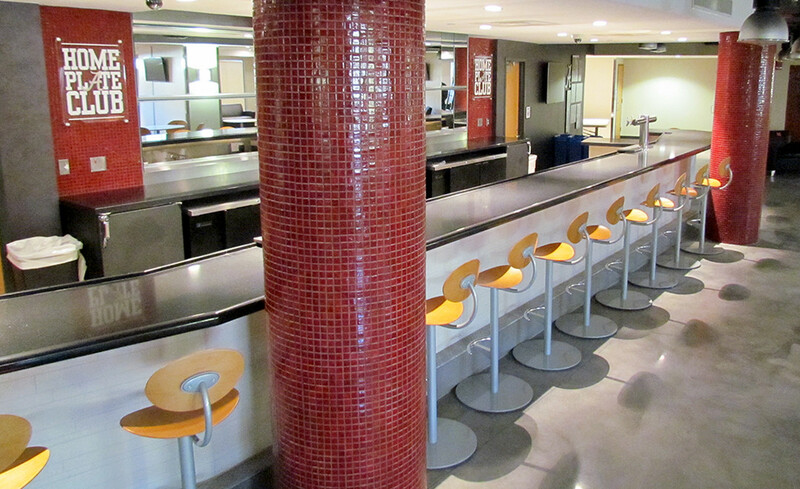 The bar is framed by large columns coated in brilliant crimson red mosaic tile. The food preparation and serving area behind the seated bar also feature Mystic Black Zodiaq Quartz backed by crimson red mosiac tile wall accents. Dupont Zodiaq Quartz countertops are nonporous, durable and easy to clean. The Zodiaq surface is scratch-resistant, heat-resistant and tough enough to withstand the bumps and spills that are common in food service areas. Zodiaq Quartz is GREENGUARD Indoor Air Quality Certified® and GREENGUARD Certified® for children and schools. Zodiaq Quartz is an excellent choice for serving counters, bar tops, food preparation areas and other public venues. Zodiaq Quartz is available in a range of beautiful colors without the need for sealing or polishing.